The old typewriter had a mind of it’s own, that is, until I was assigned to the stinker in 6th period typing class. Typing along with the music with perfect rhythm in clickety clack beat was easy. But when checking for mistakes all I saw was a lot of gobblety gook and not one sensible word. At first I thought I was placing my fingers on the wrong keys, but after careful observation, I confirmed that wasn’t the case at all. It was the damn junkie typewriter. It was stubborn and had a mind of its own. After several days of its disrespect, I couldn’t take the damn thing anymore and took my fist and smashed it down on top of the keys. The keys all balled up. I thought I might have heard a little, “Owie Ouch”. No more problems. I just had to let it know who’s boss. (150 words). Barbara Beacham is the gracious host of the challenge, Monday’s Finish the Story. She provides us with a photo to use as our writing prompt along with the first sentence to be used in the story. It is pretty cool when there are 30 of them going in the same beat all at once to music. That is how Iearned to type, on a manual typewriter. What a fun story, PJ! Thank you Sonya. I had fun writing it. When I was in high school we had to learn typing on manual typewriters. The school couldn’t afford electric ones for the students. Writing this helped me to remember those high school days. Hahaha! I don’t think ours were that old either. I firmly believe in whacking a machine. I’ve fixed more things like that for sure, my kids think I’m magic. We had a really really big typewriter in the attic I would go sneak up and play with all the time when I was little but I learned to type on a computer. Now I’m slowly learning how to thumb type on my phone…. Oh that thumb typing! I have to do that on my phone too. If my nail breaks on my thumb it is so hard for me to text. That’s great that you’re into photography right now. You probably just need a break from writing, and after awhile you will get inspiration to write again. Thank you for the kind comments about my writing flash fiction, but I am still learning and trying to improve. Still have more to learn and improve. That is why you are a truly gifted writer! You continue to hone your skills by learning and improving! Thank you, but I feel like I still have a long way to go. Writing flash fiction is different than trying to write something longer. Thank you Kirsten, I really appreciate you telling me that. I always “try” to stay within them and “try” to get right on the limit. That makes it more fun for me. Well done Joy showing the machine who was boss a brave move. Thank you Tommy! The stubborn thing wouldn’t type what I was telling it to! LOL! I strongly believe that hitting a machine does help…well…in my opinion it does! A lovely little story, and I like how it was resembling a power struggle. That reminds me of myself and computers! Sometimes it is like they are refusing to cooperate. Oh yes! There is definitely a power struggle between humans and computers. LOL! And we keep making them more and more like humans (in a way). Thank you. Oh, I am sorry, I misspelled your name. I updated my post with the correct spelling. I’m sorry Barb. No worries and no need to apologize! Be well Joy, and a huge hug to you! Oh yes, we had to stay at a certain rhythm! I took a classical course (Latin) in HS so I had to go to typing during lunch hour…but those sisters devoted their time even at lunchtime for us:) The rhythm actually helped for dexterity. That rhythm was nice. We got a lot better at typing because of it. Oh yes, every single day in typing we had to “get our typing rhythm”. It was actually was a lot of fun. This was when I was in high school typing class and we had to learn on old manual typewriters. I can’t remember if we used music in college when we were learning on the IBM Selectric typewriters or not. I think we did. One thing for sure, this comment is dating me! Haha! It’s always fun to learn about the past. Things have been changing pretty quickly these past 20 years! More so, I think, than ever before. Oh yes! Changes have changed in huge ways! Mostly good ways, except that life was much simpler back then. Haha! He just needed a little attitude adjustment. LOL! Thanks Millie! I had fun writing this one. All I had to do was remember my high school typing class. LOL! Lovely write Joy ~ Sometimes physical reinforcement is the only way forward ~ Discarding the old and installing the new ~ Perhaps there is a heaven for battered typewriters. I made sure I didn’t hit it too terribly hard, just hard enough to get my message across. As for heaven, he would have to straighten up his act first. Hahaha! I think that would be my response to willful behaviour. 🙂 We had a snes game console that used to do it’s own thing all the time. A quick thump and it behaved itself. That’s funny. I have had a few electronic items that needed a kick or pound and it would start running right. 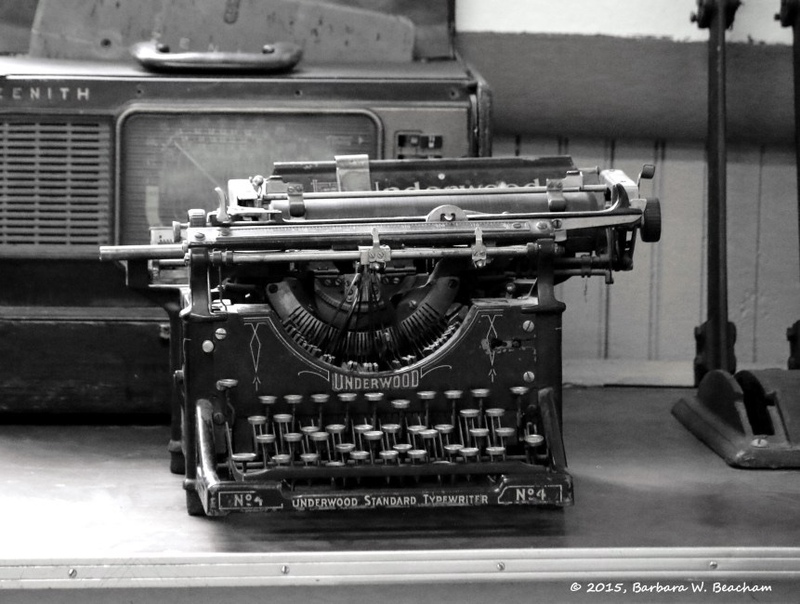 I like the clickety clack.. hopefully the typewriter now knows who’s the boss and keys in correctly. Loved the story. Thank you so much! I had fun writing it.